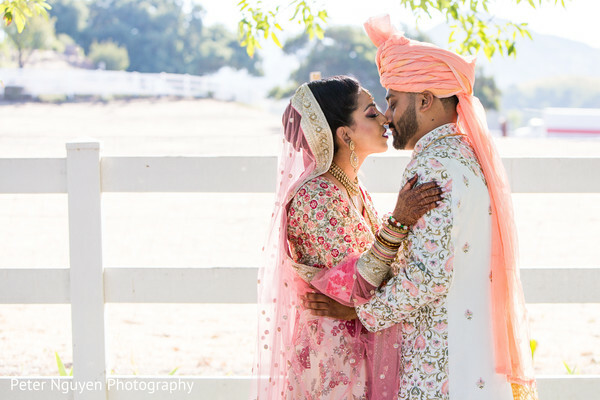 Following their pre-wedding events, Nilam and Jay’s glamorous wedding ceremony was held at Saddlerock Ranch, a beautiful location in the Santa Monica mountains, surrounded by vineyards, rose gardens and oaks, what an idyllic setting! 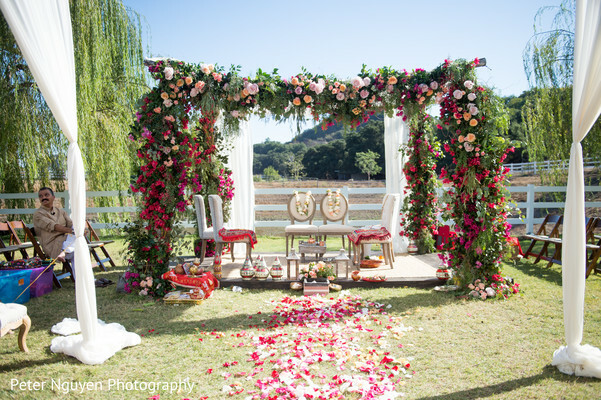 Behind the lens, Peter Nguyen Photography, did not miss any moment of the big event. 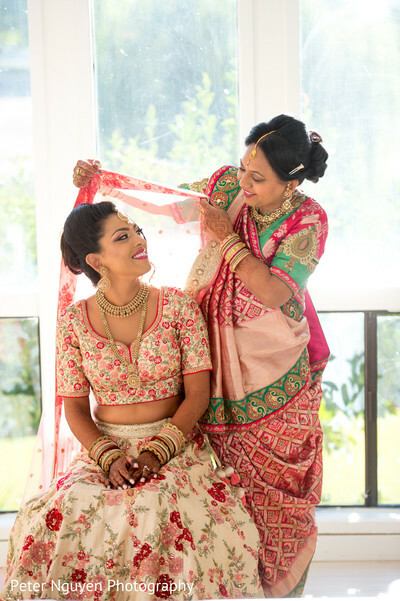 For the wedding ceremony, Bride Nilam donned a cream floral embroidered lehenga with a blush pink dupatta. 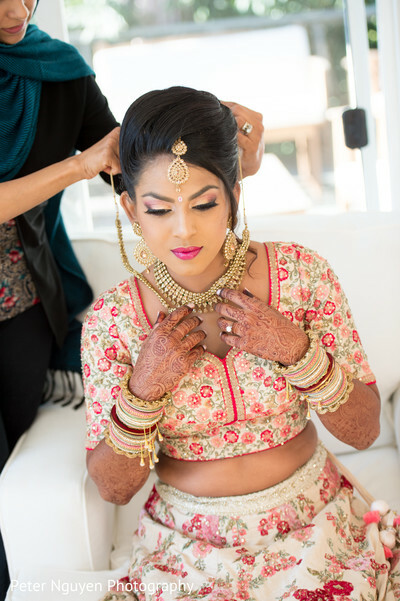 Her glowing makeup was a true vision achieved by My Fair Bride. 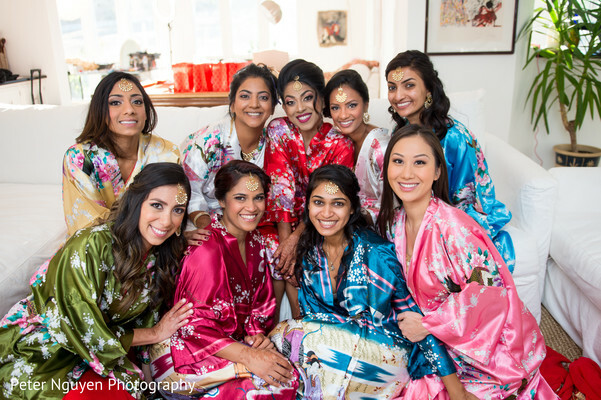 I have to say I totally fell in love with the bridesmaids’ “getting ready” Japanese style robes, what a unique way to start the beauty process for the bride’s team. 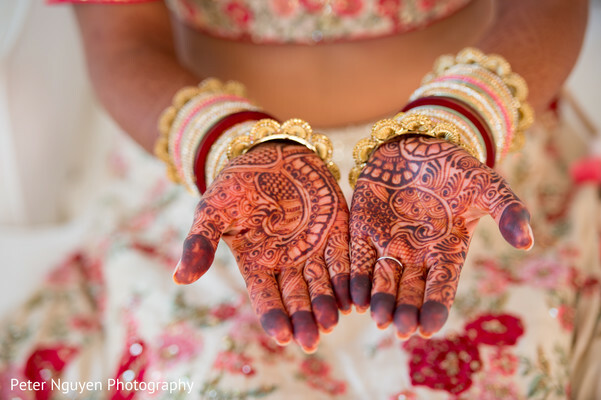 In the blink of an eye our Indian beauty was ready to see the man of her dreams. Jay’s look on his eyes said everything, He was ecstatic! 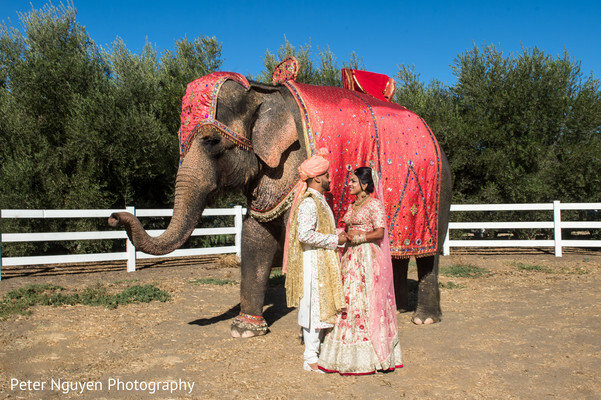 Have Trunk Will Travel provided one of the biggest details of this wedding! 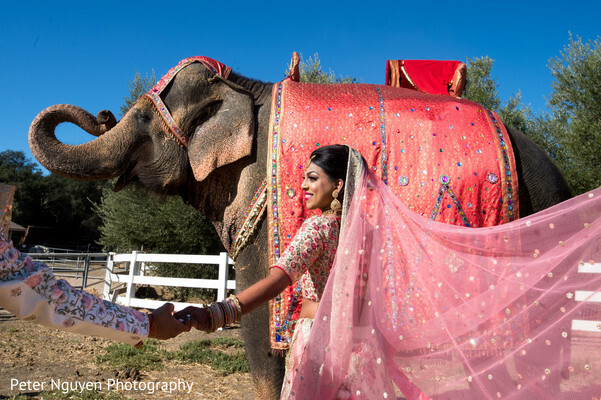 a magnificent elephant who transported the groom during the baraat procession but also gave his best poses for the wedding photoshoot. 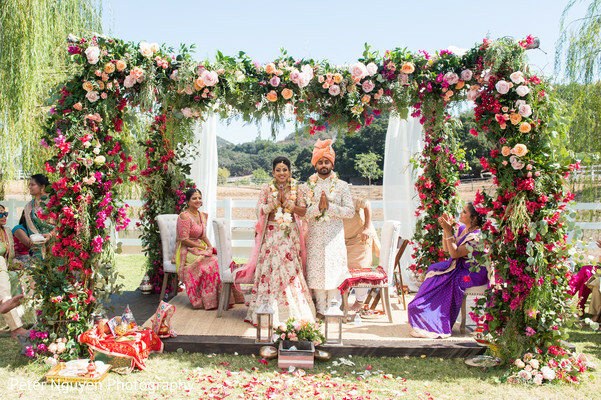 The sacred vows were exchanged under a distinctively designed Mandap by Shawna Yamamoto Event, all of the flowers blended perfectly with the natural surroundings of Saddlerock Ranch. 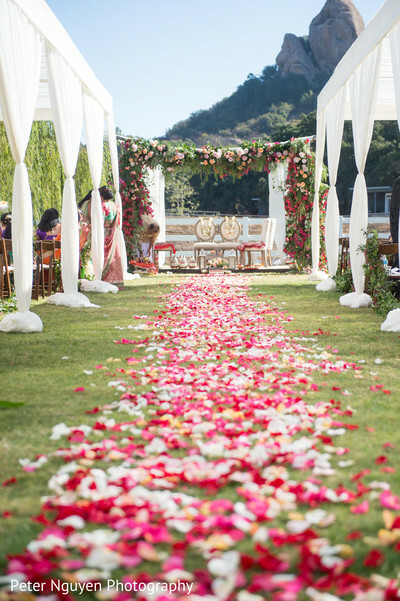 The beginning of the journey for the bride and groom was a masterpiece thanks to Planning Elegance and Best Friend Events, who helped the newlyweds enjoy the best day of their lives and not worry about a thing. 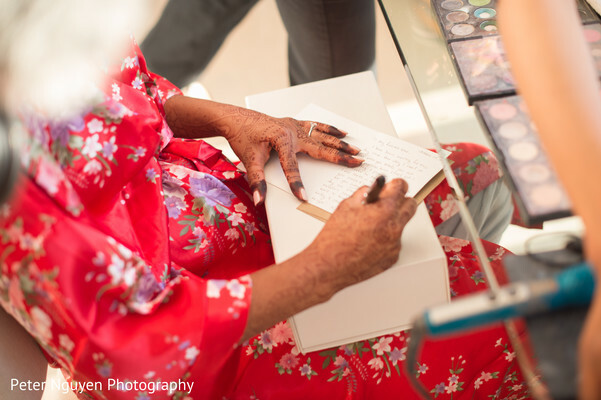 All the sophisticated and elegant moments can be relived by the fascinating images of Peter Nguyen Photography in the gallery. 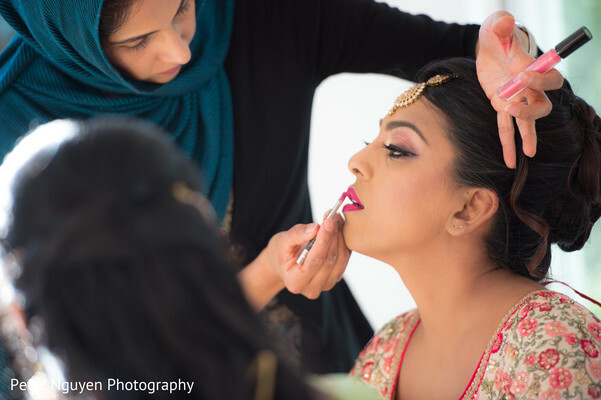 The glam bash is next, make sure to stop by and get more inspiration!